- Duplicate files with the same name. - Non duplicate files with the same name. - Files that have the same name and approximately the same size. - Files that have a size of 0 bytes. 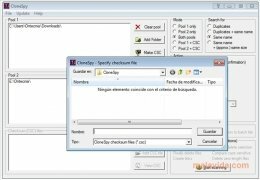 Once it has found and filtered all the files that can be eliminated, CloneSpy shows a list so that you can decide what to do. Once you have reached that point, it is even possible to view a checksum of the folders and the files to know if they have changed. All those that think that downloading CloneSpy free is something superfluous on their PC, should consider the amount of duplicate files that they can have, the lost files and those that they don't even remember that they had copied various times. All these files can occupy a lot of space on the hard drive, and thanks to Clonespy it will be possible to eliminate them.